I joke that I'm a gateway drug. It's true!! But drugs are bad. Triathlons are NOT bad!! 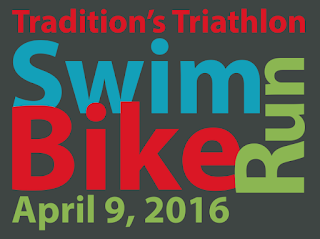 Tradition's Triathlon is on April 9th. A sprint triathlon at Tradition Village, Biloxi, MS. 1/3 mile lake/pond swim (fresh water, clean, critter free), 17 mile rolling bike course, 3.1 mile multi-surfaced run (road, sand, trail). Great venue, great after party, great prizes! 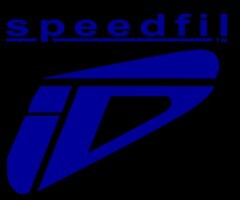 Perfect for beginners, intermediate, or expert triathletes. Brand new for 2016, an AquaBike. 1/3 mile swim + 17 mile bike (same courses, same start). Also new for 2016 - CASH PRIZES! Bonus: Tradition's Triathlon is a qualifier for the National Senior Olympics in Birmingham, AL. 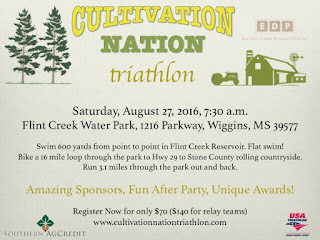 Cultivation Nation Triathlon in it's second year, is on August 27th. You'll swim 600 yards in Flint Creek Water, bike 17 miles in beautiful Stone County, and run 3.1 mostly off road miles. It's a challenging course but super rewarding! It too is great for beginner to expert triathletes. Camp at Flint Creek and indulge in all the beauty Stone County countryside has to offer!! Great food and unique awards for top finishers. 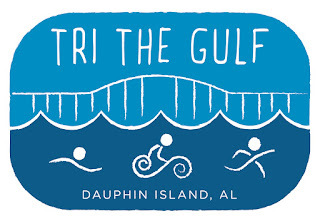 Tri the Gulf is brand new and sure to be a hit on October 15th. A unique and scenic destination race on Dauphin Island! 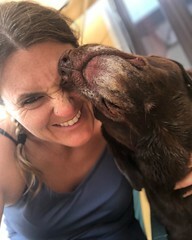 A sprint triathlon for you to SWIM 600 yards in protected Gulf waters; BIKE 13.3 miles across the island and cross the infamous Dauphin Island Bridge; and RUN our beautiful Island grounds, experiencing breathtaking views and the sea life. 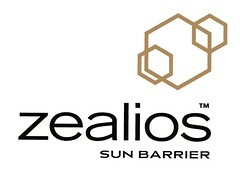 Ideal for beginners, intermediate, or expert triathletes! Age group awards and a special gift for all finishers! If you're ready to swim, bike, run, and relax, TRI the GULF!